Set sail on the lakes this season with an updated look to your boat without the hassle of painting using vinyl boat graphics. Pinnacle has seen an increase to boat graphics in recent years because unlike paint, the graphics can be removed or replaced over time. Area lakes in the Southeast are covered with boats year-round because of the variety of fishing and water-sports that they provide. Your boat doesn’t have to be the size of a yacht to stand out in the crowd – it doesn’t even need a motor. From kayak to house boat, boat graphics can elevate your image and personality of your craft. Here are 5 ways to get your vessel ship shape before heading out on with family or friends during the wonderful time of year. The most basic way to give your boat a new sparkle is to update your existing license numbers or name. Pinnacle can remove the old lettering from the hull and replace it with approved vessel numbers that stand out on the lake for easier compliance. 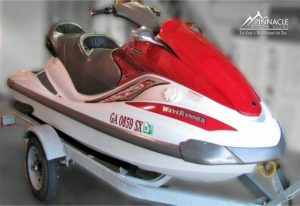 We can also upgrade your boats name by adding a creative touch to the graphics for your boat name. If you want to take your boat one step further, choose a theme for your boat that allows you to add visual graphics to the outside. Many boaters like the idea of images from fish to action images of water sports on the side of their craft to help set them a part in a sea of vessels during busy times of the year. 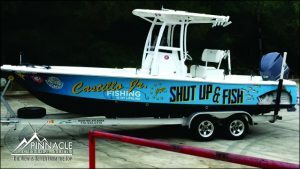 Pinnacle can create graphics that support your theme and the personality of your boat. From basic black and white to shocking bright reds and oranges – every boat and boat owner have a color selection in mind. Pinnacle can create proofs that help you visualize the design of your boat after graphics are applied so that you can select the right color palette. While more colors or gradient color changes are more time consuming in costly, the sky is the limit in the creative process behind your design. If you spend a lot of time on the water at night, reflective vinyl maybe the way to go. Reflective Vinyl not only helps you to customize the look and feel of your boat, but adds an extra element of safety for those who enjoy the water after dark. Reflective vinyl lights up when another boater’s light catch the graphics. If your graphics are designed for branding the boat it adds a marketing element to the boat afterhours. If you are new to the boating world, it makes sense to add reflective vinyl to your vessel to be prepared for those late-night voyages. Where is daytime hobbyists will notice no significant difference in the graphics. 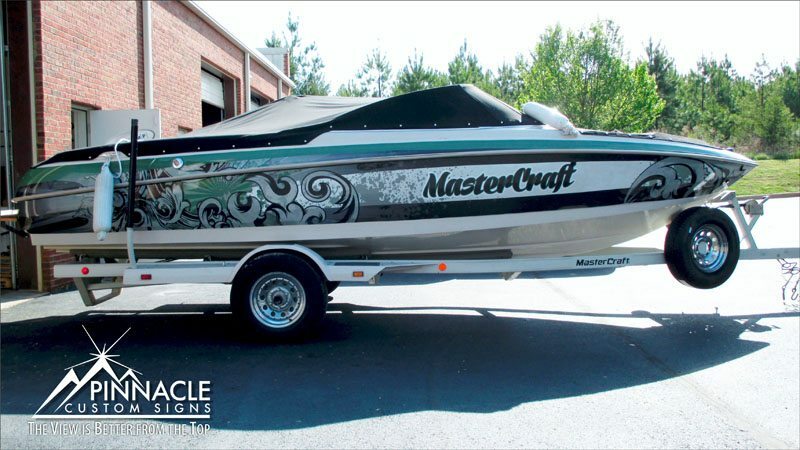 Adding a full custom designed vinyl wrap to your boat will instantly transform it regardless of the original color and set it apart on the water. Full Boat Wraps add great value to your boat but it will also protect your paint and clear coat underneath the wrap. Making the decision to wrap the boat can be a great investment decision in the long run if you are considering trading or selling the craft. Vinyl wraps can easily be uninstalled and the boat can be traded in for top dollar from the protected paint. 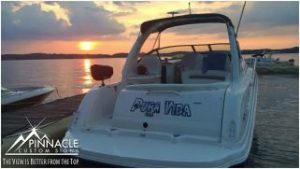 Pinnacle has plenty of experience in producing high quality boat graphics and is located just minutes from Lake Lanier and can easily access Lake Altoona, Lake Burton, Lake Oconee, and Lake Hartwell. We also have a team of installers across the United States who can help you spruce up your boat for the season, just give us a call to get started.